A growing trend in multiple entertainment franchises such as television, film, and video games is to have comic book continuations/prequels/filler as part of their transmedia campaigns, which relates to tquattle’s article on Language as a Rabbit Hole, since such continuations pull fans into different parts of the story worlds involved. The trend also allows for many different kinds of creators to be involved in a franchise (e.g., a comic artist could be involved in a film franchise), encourages fan curiosity and serves as additional advertising. 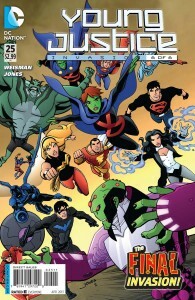 One of the issues for the second season comic series for “Young Justice”. “Young Justice” (from the recent animated televisions series) and “Heroes” used their companion comics principally for filler content to expand on details presented in each show that were not given enough on-screen time. 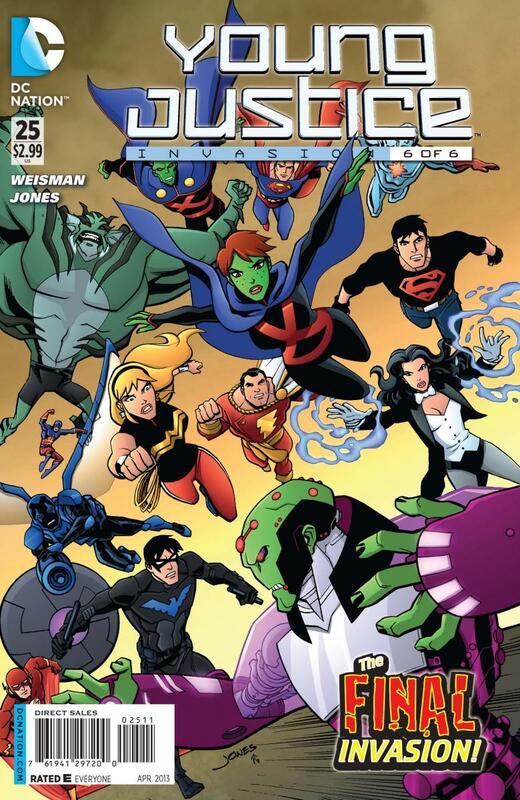 The “Young Justice” comic filled in gaps between episodes and explained certain references in the show, like Superboy’s hate of monkeys and the Terror Twins. The “Heroes” comics explained the backstories of several characters that appeared only briefly in the television series, like Hana Gitelman, who was referred to by her online alias in the television series and otherwise appears in only one episode of the series. In the graphic novels, we learn that she is actually well known to a large number of the “Heroes” cast, including Mr. Bennet, who recruits her for the Company and trains her for some time, treating her like a second daughter. 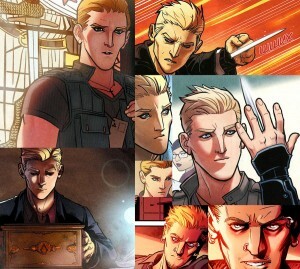 Numerous franchises use comics as prequel and sequel mediums. “Avatar the Last Airbender” filled in content between its two series with two comic book trilogies. The first trilogy, “The Promise”, takes place shortly after the end of the first television series, and is a sort of epilogue for the show. Following “The Promise,” “The Search” was meant to answer the important question of what happened to Fire Lady Ursa, Zuko and Azula’s mother. This is a question that has haunted ATLA fans for a long time. The recent “Tomb Raider” (2013) video game is slated to have a comic continuation written by Gail Simone and set between that game and the next in the series. Daniel Cross as he appears in “The Chain” and “The Fall”. the core franchise. The video game series “Assassin’s Creed” introduced Daniel Cross and his Russian ancestry into its story through two graphic novels: “The Fall” and “The Chain”. Cross is a central reason for why the Assassins are low on numbers and “losing” the battle with the Templars at the start of the video game series, which is alluded to in the first and second games. 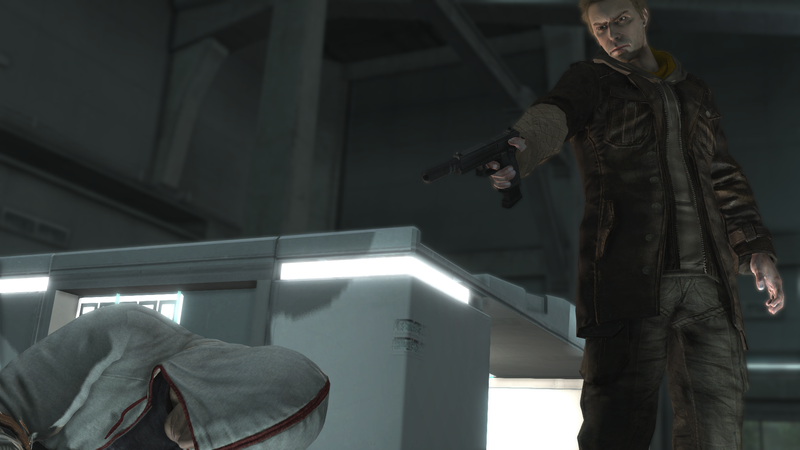 He infiltrated them as a sleeper agent, learned their secrets, and opened them to attacks from Templars when he went back to them. His efforts afterward led to the discovery of Desmond Miles (the star of the first three games), which eventually leads to Desmond’s capture before the start of “Assassin’s Creed.” He finally appears in-game in “Assassin’s Creed III.” Comics are an easy way to insert things for a story without full-on treatment in the core series. If Cross had been introduced solely in-game, his story might have been greatly truncated, since he is not the principal antagonist or protagonist. 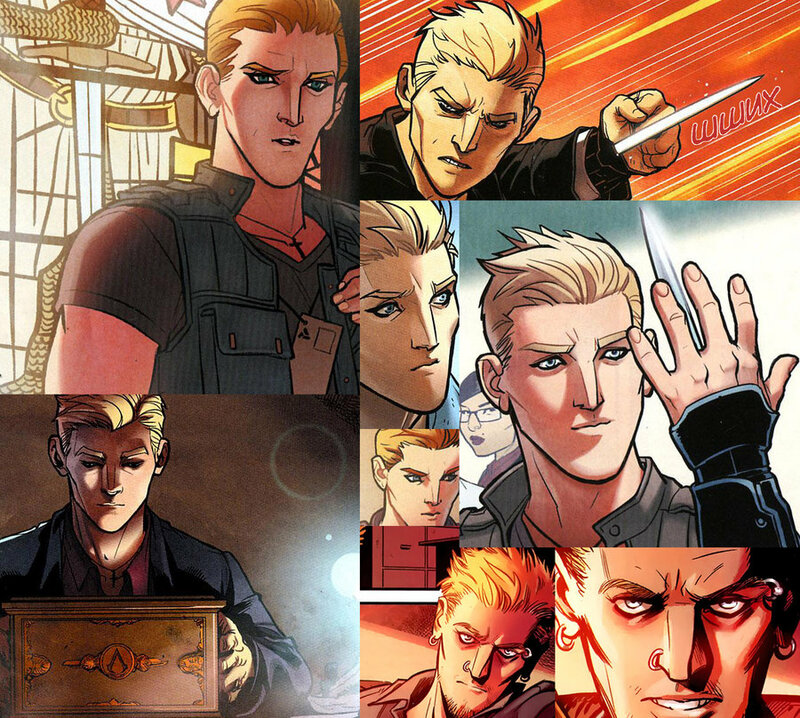 In the comics, he has plenty of room for character expansion. Daniel Cross (upper right) as he appears in “Assassin’s Creed III” sometime in the middle of the game, aiming a gun at Desmond Miles (lower left), the game’s protagonist. 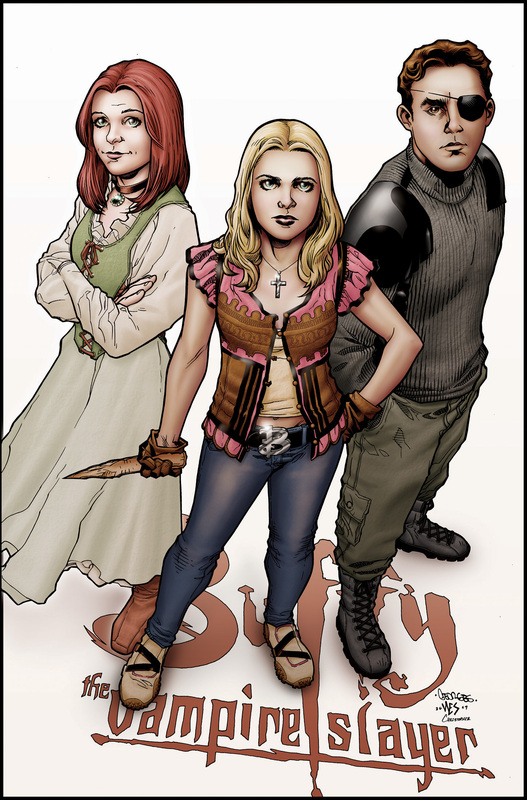 Willow, Buffy, and Xander from “Buffy the Vampire Slayer” in their season 8 comic incarnations (this was special cover art for one of the comic issues). A more common trend is to have a show carry on with its seasons after cancellation in comic form. 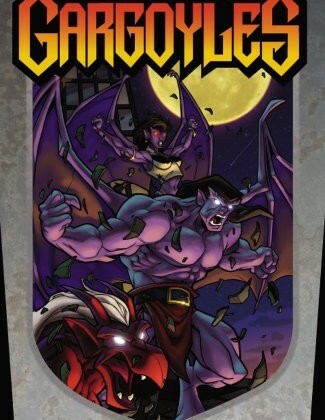 When the animated television series “Gargoyles” was dropped, it was continued (ignoring the non-canonical season 3) in three graphic novels. “Samurai Jack”, which ended without finishing any of its major plotlines back in 2004, has begun a continuation in comic format, with the hope of eventually finishing up the series for good. “Buffy the Vampire Slayer”, “Angel”, “Smallville”, and many others follow this trend. Why do this at all? It goes without saying that comics can be a very lucrative franchise in America. Creating comics and getting consumer support is another way to support franchises, especially if a franchise has a fanbase but is not marketing well for some reason in its current medium, and it is a way to encourage the return of that franchise after cancellation. Another reason is to reach out to the already large comic book audience. Furthermore, comic audiences are often already attracted to these franchises, and creating comics for them to consume is simply an easy way to further appeal to them. 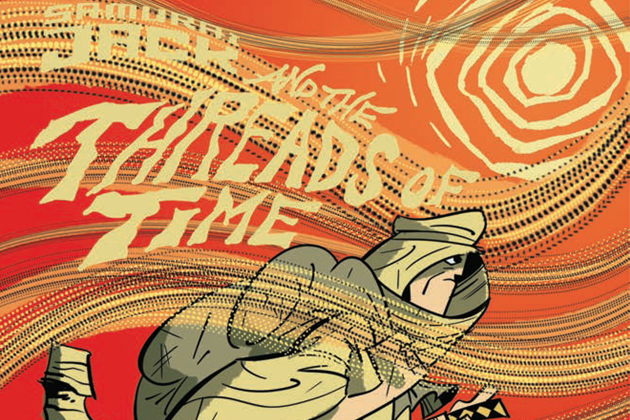 The opening for the new Samurai Jack comic, with the title card for the threads of time storyline. Woman, the series doubtless brought interest into the comic versions of these newer characters, especially in the wake of the Flashpoint and New 52 events that already have large publicity campaigns. Pulling people into the comic medium has the potential to pull interest into other franchises also owned by umbrella companies who own these franchises. Someone interested in “Smallville” who was attracted to the New 52 franchises might look into some of DC Comics’ recent live-action and animated films, older comics, and television shows. Fans who like certain authors and artists also tend to check out their other titles, even if they are unrelated to their first glimpse at the creator. Comics are also relatively easy to produce. While it still costs a lot of money and takes a lot of time to create a comic, the cost is significantly smaller than an animated or live-action film, an animated or live-action television series/episode, or a video game. Film and television share pros for this transfer. They have no casting calls, no lines of dialogue to memorize, no make-up and costume departments, no prop creation, no sets, no catering for crew members, no travel for equipment and cast, no camera crews, and, more often than not, no music. Aging actors is not a problem and budget requirements are exponentially smaller. There are also fewer limits for the imagination of the creators, given the near-limitless potential of whatever a person can draw, rather than what someone can create through CGI, props, costumes, and make-up and the limits of the human body as canvas. Far fewer people are involved overall, there is lot less fighting about story development, and it is also a lot easier to fix mistakes. That is not to say that it is not difficult to create a comic, or that such a move does not have problems. In the average comic, there can be more than one writer, someone who does pencils and inks, a colorist, plus one or more editors and possibly a separate cover artist. Advertisements are often used to keep the price down. The pages have to be mass-printed or put out for public consumption somehow, and this has to be managed, whether they are put up on comixology or iTunes or sent out to comic book stores for purchase. Creators have to do a lot of research and fact checking on environments, the history of the world they’re writing, etc. Publicity is needed to promote it, and it is often very difficult to gauge consumer interest due to the complicated workings of the comics market. There could be a lot of overhead and too much friction between the writers/artists and editors. 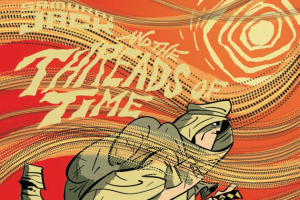 A lot of drama can occur in the creation of a comic, even in the single issues. Still, all of this is a lot easier to deal with than a full-on film, television show or video game requires. Sacrifices are also made in transference. Notably, comics typically do not include sound components. Numerous online and digital comics, as well as flash comics have moved to add this aspect in, but most comics do not have this. Music is not always absent from these comics – characters can hum songs or hear them on the radio, all of which can be written on the page. Also, while comics are popular, they can be harder to get access to than, say, a full-length film that goes into theaters, which hinders its audience. Two ways to fight this problem are increased publicity and continued modification of comic publication to better help consumers. Varying skill levels of artists and authors picked for each issue can also be a problem, although this is true for core franchises, although sometimes this is a turn-around, and a different outlook on the same story concepts can be truly refreshing, such as Gail Simone’s recent turn at “Red Sonja” and Ross Campbell’s turn at “Glory”. Altogether, if a franchise wants to add extra content in the form of a prequel, sequel, filler or to explain certain events that the core franchise did not make time for or that will lead into further additions to the franchise, a comic is a lucrative avenue for this. This post contains copyrighted material, the use of which has not been specifically authorized by the copyright owner. I am using such material in an effort to compare the visual translation of content between mediums. I believe this constitutes a ‘fair use’ of any such copyrighted material.